First of all, before I start this review, I just think that it’s important to point out that all those people going all, “BUT IT’S HARRY POTTER!! !” need to calm down. Obviously if Simon Snow was extremely similar to Harry Potter then it would only make sense for this book to seem quite similar to Harry Potter itself. 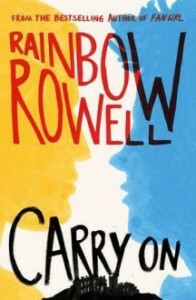 It’s written like fan fiction because you just have to accept the fact that Carry On is technically a fan fiction for Cath’s fan fiction in Rainbow Rowell’s book about fan fiction. Anyway, moving on with the review: I was okay with this book. I know a lot of people were saying that this is their new Rainbow Rowell favorite, but in my opinion, Fangirl will always be my number one! The first 40% was very difficult for me to enjoy. Probably because most of it was me thinking that Simon Snow was a bit too focused on finding Baz everywhere and it got me thinking that Simon was searching for Baz more like a mad lover than someone concerned with worry. It was great once the actual plot started though. I think in terms of characters, I like Penelope, Simon, and Baz. Also, Lucy’s perspective was great to read about. I really, really hated Agatha, to be honest. Every time she’d come into a scene into the book, I thought my eyes would go into the back of my head from how much I’d be rolling them. The magical words and spells were really fun to read about! the Mage being Simon’s dad and the lady calling Simon his rosebud boy was actually his mom. but I guess it’s something I have to come to terms with. Overall, this book is okay. The characters were good, and the setting and the magic were very well explained and developed. I did see a lot of similar traits to Harry Potter, and this book could have been better in terms of pacing, but I thought it was okay.